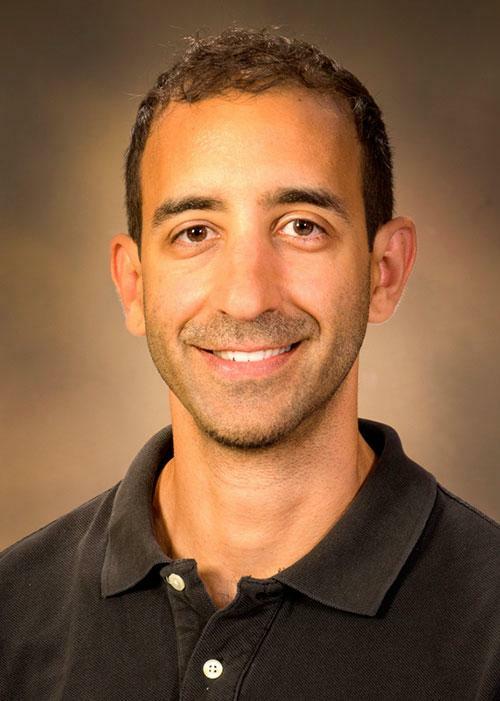 Yann C. Klimentidis, PhD, assistant professor and genetic epidemiologist at the University of Arizona Mel and Enid Zuckerman College of Public Health, has received a $1.1 million grant from the National Heart, Lung, and Blood Institute to determine the genetic and biological connection between Type 2 diabetes and cardiovascular disease. His research team also will examine why cholesterol-lowering statin drugs are linked to an increase in the risk of Type 2 diabetes, even as they reduce the risk of heart attacks. According to the U.S. Centers for Disease Control and Prevention's 2017 National Diabetes Statistics Report, an estimated 30.3 million people of all ages – or 9.4 percent of the U.S. population – had diabetes in 2015. In 2014, 1.5 million hospital discharges were reported for major cardiovascular diseases, with 70 percent of those patients having diabetes. The genetic basis of obesity and related diseases is the focus of Dr. Klimentidis' research. He uses genetic information to understand exactly why and how disease occurs. This knowledge can be used to minimize health disparities, individually tailor treatment and prevention plans and improve prediction of disease risk. "A biological overlap exists between cardiovascular disease and diabetes and it creates a bit of a puzzle. We know that high glucose levels present a risk for Type 2 diabetes and high cholesterol presents a risk for cardiovascular disease," Dr. Klimentidis said. "I'm trying to find genes that affect both cholesterol and glucose, especially those that affect them in opposite directions, contrary to expectations." Dr. Klimentidis cites statin drugs as an example of this interesting overlap. People who take statins to lower their cholesterol are at a slightly higher risk of developing Type 2 diabetes. "If we can understand why this happens, the information could help us to prescribe drugs more carefully, based on a patient's genetics," he said. The investigators will review multiple studies using publicly available health and genetic data from the Database of Genotypes and Phenotypes in the United States and the UK Biobank in the United Kingdom, giving them access to data on at least 650,000 individuals. "This study is an incredible example of how the University of Arizona is using precision medicine to further our capacity to treat disease and improve outcomes for patients. It is crucial that we better understand the physiological pathways underlying chronic diseases, such as heart disease and Type 2 diabetes, which are among the leading causes of death and disability in the United States," said UA President Robert C. Robbins, MD. "The findings of this study could help identify people with a genetic predisposition to these diseases, and lead to the development of targeted prevention and treatment strategies. I am very excited to learn what Dr. Klimentidis and his team discover with this new grant." Dr. Klimentidis and co-investigators on this collaborative study form a multidisciplinary team: Jin Zhou, PhD, assistant professor of biostatistics, UA Zuckerman College of Public Health; Craig Stump, MD, PhD, associate professor, UA College of Medicine – Tucson; Alexis Wood, PhD, associate professor of pediatrics and nutrition, Baylor College of Medicine; and Jose Ordovas, PhD, professor of nutrition and genetics, Tufts University. NIH, National Heart, Lung, and Blood Institute Grant No. 1R01HL136528-01A1. This new study builds on previous research by Dr. Klimentidis and colleagues published in the journals Circulation: Genomic and Precision Medicine, 2/5/2016, and PLOS Genetics, 5/28/2015. Established in 2000, the Mel and Enid Zuckerman College of Public Health at the University of Arizona Health Sciences is the first nationally accredited college of public health in the Southwest. Today the college remains the only accredited college of public health in the state of Arizona with campuses in Tucson and Phoenix. The college enrolls more than 1,100 students per year across degree programs at the bachelor's degree, master's degree and doctoral levels. Through research, education and community engagement, the UA Zuckerman College of Public Health continues to find solutions to public health problems in Arizona, the Southwest and globally. For more information: publichealth.arizona.edu. The University of Arizona Health Sciences is the statewide leader in biomedical research and health professions training. The UA Health Sciences includes the UA Colleges of Medicine (Phoenix and Tucson), Nursing, Pharmacy and Mel and Enid Zuckerman College of Public Health, with main campus locations in Tucson and the growing Phoenix Biomedical Campus in downtown Phoenix. From these vantage points, the UA Health Sciences reaches across the state of Arizona and the greater Southwest to provide cutting-edge health education, research, patient care and community outreach services. A major economic engine, the UA Health Sciences employs approximately 4,000 people, has approximately 800 faculty members and garners more than $140 million in research grants and contracts annually. For more information: uahs.arizona.edu.